By default, WooCommerce provides an option to add a note to an order and this feature is very useful when you want to add some specific info related to the order. But what if you want to add a note about the customer? In this article I’m going to show you how to add WooCommerce Customer Notes to your shop as well as how to share these notes with your team. What can you do with customer notes? Share critical customer information with your team. Remember an important detail about a customer. Notify your staff about an upset customer. Reminder to send a discount coupon to a customer. Capture knowledge about the WooCommerce customer history. Avoid errors from your team. 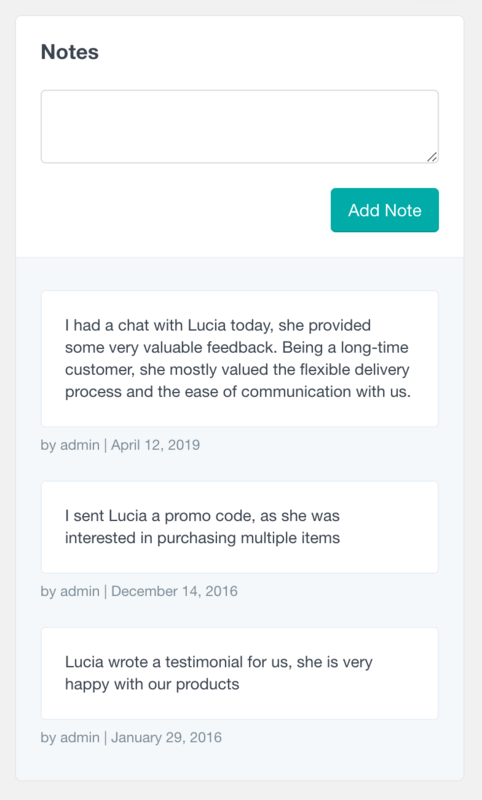 Thanks to the User Notes feature of User Insights and the WooCommerce module you can now add and share WooCommerce customer notes with your team. In this article we are going to see how to use the customer notes functionality to capture customer related info, as well as share some tips about how to improve your WooCommerce customer management and organization. Please note that since Users Insights works with registered WordPress users only, this feature will work only for your WooCommerce customers that have a registered WordPress account. 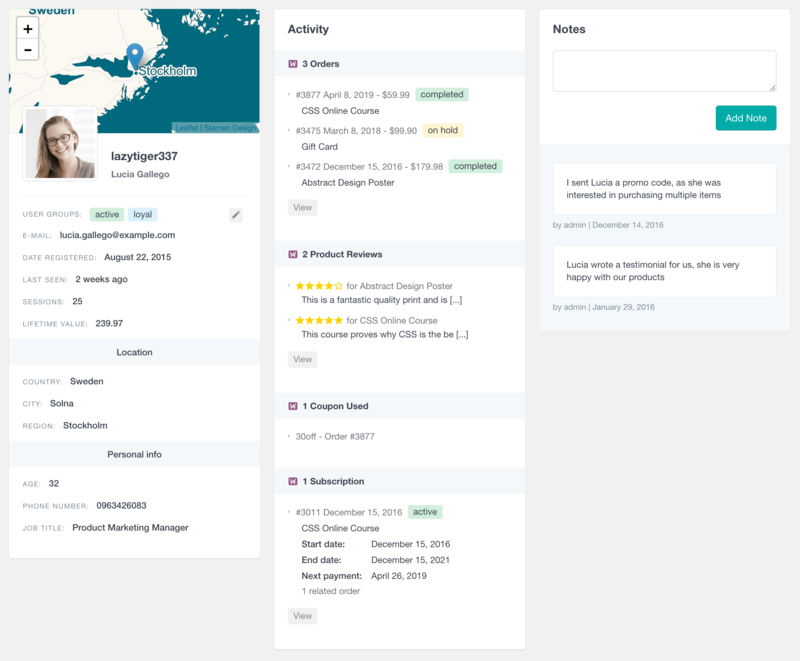 The first thing to do is open the Users Insights plugin page in your WordPress dashboard and find a customer that you’d like to add a customer note to. You can do this either by just browsing trough the customers in the user table list of Users Insights, or you can use the Users Insights smart filters to search for a particular customer. Once you have located your customer from the list, go ahead and click on the customer’s username. This will open the user profile page of Users Insights. This is a page where you have all the information about a particular customer that Users Insights has detected. This includes the default WordPress user data, WooCommerce billing data (country, city and region) and the WooCommerce activity (such as orders, reviews and coupons used). On the right side of the user profile page you will find the User Notes section. This is where you can see all the notes for the customer as well as add new ones. For this example, our customer has two existing notes and we are going to go ahead and add a new one. Once we write the note and press the “Add Note” button, the new note will be added to the list of customer notes. The note will also include some info about its author and the date of its creation. The notes will be ordered in a chronological order, showing the newest notes on top. Each of the notes can be also deleted in case it is not relevant anymore. The user table of the Users Insights plugin also has a notes column where it shows the number of notes that every customer has. If you can’t see the “Notes” row in the table you might need to show it by clicking on the “eye” icon. Clicking on the title of the “Notes” column will also sort the user table by the number of customer notes they have. This can be a useful feature if you want to find all the customers with the most or least notes added. The “Number of Notes” filter allows you to filter your WooCommerce customers by the number of customer notes they have. Number of notes is X. Number of notes is greater than X. Number of notes is less than X. The free extension for Users Insights Extended CRM for Users Insights includes an option to show the date of last note for each customer in the user table. This can be a handy feature because it allows you to sort your customers by this field and have an ordered list of your WooCommerce customers with the most recently added notes on the top. In this way you can always know if a new customer note has been added recently by someone from your team. Additionally, the Last Note Date field is available in the filters, so you can segment your customers by this field. For example, you can apply a filter like “Last note date is 30 days ago”. The Extended CRM for Users Insights extension also adds is the ability to add a sticky note. Making a note sticky will make the particular note always stay on top in the customer notes list. This can be very helpful if you want an important note to be easy to notice. The sticky notes are in a different color so they can be different from the regular notes. WooCommerce itself has a similar feature, the order notes. But the order notes are tied to the orders, as opposed to the customer. The WooCommerce purchase notes are useful for adding order-related information, with the same goals that the user notes have. But it’s possible to add these notes to the Users Insights user profile. 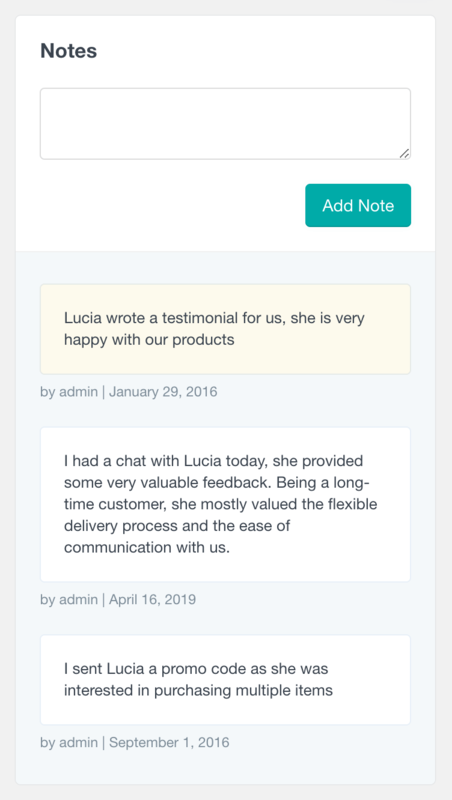 In order to include these WooCommerce custom notes to the customer profile, you’ll need to use the Extended WooCommerce Customer Management for Users Insights plugin. 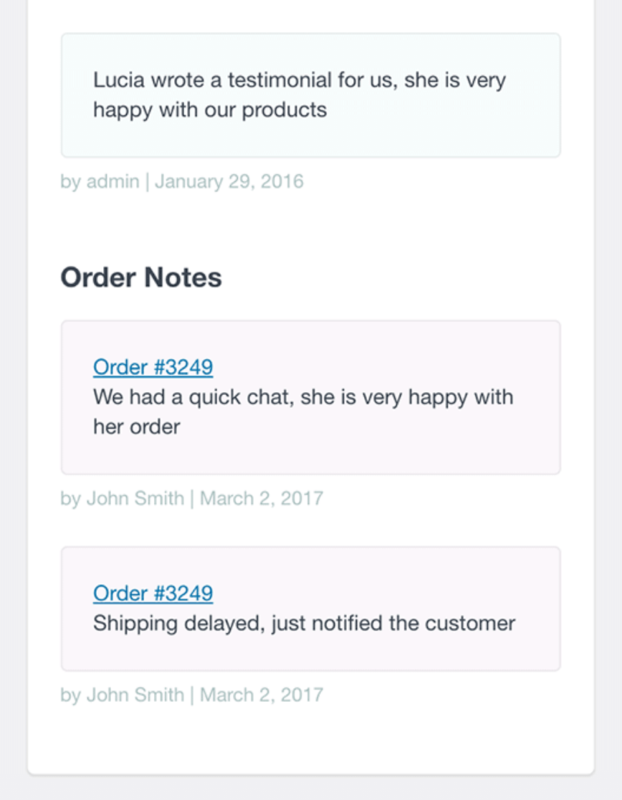 With this extension you can not only read all your customer notes but also all of your customer’s order notes in a single place. This may be handy if you use the order notes as a way to communicate with your team. These WooCommerce purchase notes, when viewed in the user profile, can help you greatly in terms of organization. You can quickly see which orders have issues, which customers have changed their mind over time or how your team has dealt with difficult situations. 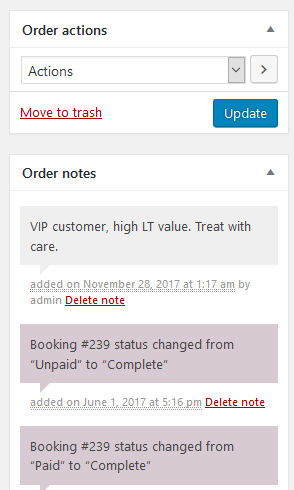 Although WooCommerce adds notes for status changes, these system status notes aren’t visible in your Users Insights profile. This helps to avoid confusion without an information overload. But you can manually add a note to the order summary if you want to. That not only helps you identify past orders turnaround, but also can help you quickly check that customer’s experience with your store. It’s also possible to use the WooCommerce customer notes for tracking, as you can add the product, order, shipment and other details in it. Hence you can use the user or order notes to create an order history that is easy to follow. That’s it! Now you know how to use the Users Insights notes feature to capture and share WooCommerce customer notes. We hope that this article helped you improve your WooCommerce customer management and organization.